I am a primary school teacher. Concern over my young son’s education brought me into contact with the world of education and stimulated a latent desire (I had taught French long ago to small children) to assist children in acquiring knowledge. Whilst classroom teaching is incredibly varied and fulfilling, I prefer one to one or small group teaching, where one has real flexibility to respond specifically to a child’s areas of need. My passion for English and general love of language mean that I take great pride in encouraging my students to speak well and correctly. Learning a language should be fun and engaging, and if one can express one’s ideas and feelings accurately, then the ability to write the language will follow. I enjoy learning foreign languages and wherever I travel I always attempt to speak some of the native tongue. I’ve travelled in Asia, the Antipodes, America and much of Europe, and those experiences and people have greatly enriched my life. My degree from London University is in French and German. I also have a PGCE in primary school teaching, and I am a homeopath. 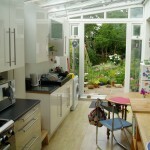 Our home is in a quiet area of south London, near to green spaces and good transport links. 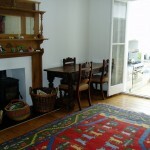 The house is large and comfortable with a lovely garden, equipped with swing and trampoline. We have a dog (mild and sweet-natured). My young son (2007) and I have lived here for seven years together with a close friend who is part of the family. 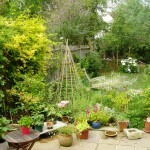 We tend to spend a lot of time outdoors, swimming, cycling and gardening. My son is a car fanatic and loves vehicles of any shape, dressing up, going camping and generally having fun. We do not eat meat, but we do eat fish and seafood. As we are fortunate to live in London, we enjoy visiting galleries and museums, seeing plays and exploring new and exciting areas. My main interests include foreign languages and culture, the Arts, yoga, gardening and entertaining. We have a wide circle of friends at our outdoor swimming pool, which is a wonderfully welcoming environment for any visitor. 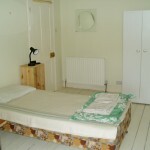 The student’s room is comfortable and cosy, with a single bed, desk, cupboard, wardrobe and armchair. 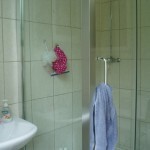 There is a bathroom and a shower room, both of which are shared. 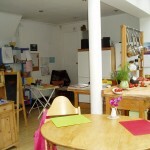 There is a very large, light kitchen where we do our learning and a sitting room full of toys. The park, ice rink, pool, cinema and shops are all within easy walking distance. 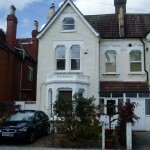 Close by, we have a large green space (Streatham Common), formal garden, ice rink, gym, swimming pool and tennis court. Also within walking distance are a cinema, theatre and local library. If we are going further afield, we take the train or bus to visit museums, parks and galleries. We also enjoy taking the car into the countryside and spotting birds and wildflowers.